David Elstein, director of three episodes of the seminal "The World At War" series, finds Dunkirk to be a powerful film but one shorn of historical context. Here he fills in the vital gaps - and finds some curious anomalies. Few movies made in Britain have been as successful as Christopher Nolan’s “Dunkirk”. Like many “British” films – and thanks to a generous tax credit scheme, coupled with a favourable exchange rate – “Dunkirk” was funded by a Hollywood studio (in this case, Warner Bros). But whereas so many of our most lucrative movies have been franchises with a fictional British character at their core – Harry Potter, James Bond, Bridget Jones – “Dunkirk” is a one-off, firmly rooted in a British reality: the evacuation of over 334,000 Allied troops from the beaches of a beleaguered French seaside resort, where a few thousand British and French troops defied overwhelming German military might for enough days in May and June 1940 to allow their seemingly trapped colleagues to escape. As do some historians, Nolan describes this event as a “miracle” – in this case “the miracle of the little boats” – but, of course, there was nothing supernatural about the outcome. Yet the mystique of Dunkirk continues to cast its spell, nearly 80 years after what in military terms can only be classified as a catastrophic defeat. After months of “phoney war”, while Hitler digested his half of Poland, so swiftly conquered in September 1939, in complicity with his hitherto arch enemy, the Soviet Union, Germany had seized Norway in May 1940, forestalling Britain’s own attempt to take pre-emptive control of the key Norwegian ports. Although the failed Norway adventure had been driven by Churchill – improbably restored to the post of First Sea Lord at the outbreak of war, nearly 25 years after last occupying that post, in a Liberal government – the deep sense of frustration over the Narvik debacle had led enough Conservative MPs to vote against their leader in a Commons debate that became an effective vote of confidence. Prime Minister Neville Chamberlain won the vote, but felt compelled to resign. Just as improbably, Churchill – effectively a Tory outcast through the 1930s – succeeded him, on the same day that Hitler launched his blitzkrieg through Holland and Belgium, slicing through the French army after by-passing the formidable Maginot Line of defensive forts. By attacking through the Ardennes forest, his armoured columns swiftly reached the Channel port of Abbeville, thereby cutting the Allied forces in two. Once Lord Gort, the commander of the British Expeditionary Force, had concluded that a counter-attack was doomed to failure, and defeat for France inevitable, he disobeyed orders to stand firm, abandoned all his heavy equipment, and ordered his troops to the vast beaches at Dunkirk, in the hope of perhaps 30,000 of them being scooped back to Britain. Soon afterwards, Belgium surrendered, blaming lack of Allied support. In turn, the British and French berated King Leopold for further exposing their retreat to German attack. What saved ten times as many troops from capture as had been anticipated was a combination of Hitler’s hesitation in driving home his advantage, perhaps fearing for his tanks in the marshy outskirts of Dunkirk; fierce resistance from those British and French troops who remained behind to face the onslaught (and inevitable capture); an extraordinary spell of fine weather which left the Channel becalmed; and the success of hundreds of RAF fighters in fending off swarms of German bombers, engaging in day after day of dogfights high above the beaches. The final factor was a well-executed evacuation plan, master-minded by Vice-Admiral Ramsay from Dover. It was Royal Navy destroyers which rescued the great bulk of the troops, aided by some 700 “little boats”, mostly requisitioned but some piloted by their owners, which could sail almost up to the sand, and ferry thousands of soldiers to the bigger ships, or carry a cargo of “pongos” back to England. Puzzlingly, at the end of the film a naval officer played by Kenneth Branagh tells an army officer played by James D’Arcy that 300,000 British soldiers have been rescued, and it was now the turn of the French: yet more than a third of those rescued, 120,000, were French (nearly all of whom were soon afterwards returned to France, in time for their country’s surrender later in June). When it is so easy to get these details right, why go out of your way to get them wrong? Nor is there any sign of the hundreds of Indian troops amongst those gathered on the beaches (who, as many cinemagoers have noted, seemed remarkably well-fed and clean-shaven for that time). Evacuation from Dunkirk was not a sudden brainwave or improvisation: in May 1918, as successive German onslaughts threatened to break the Allied lines in Flanders, Haig and the War Office contemplated exactly the same withdrawal of that war’s British Expeditionary Force, again abandoning all its heavy equipment. In 1918, the German attacks subsided. In 1940, more effective German tactics prevailed. Yet, remarkably, British casualties during the bare month of fighting in France were little more than 3,000 dead. Six destroyers were indeed sunk (the film emphasises their destruction), along with over 200 of the “little ships” (of which we are shown nothing). But that was an acceptable rate of attrition in the circumstances. It was the RAF (or the “air force”, as Nolan’s soldiers helpfully call it, for the benefit of non-British audiences) which bore the heaviest relative burden, losing nearly half its fighter aircraft in a matter of weeks. It was not just King George VI who heaved a sigh of relief when France sued for peace (“alone at last”). Hugh Dowding, head of Fighter Command, knew that a much more decisive battle faced Britain in the coming weeks, and had strongly opposed Churchill’s decision to send an additional 10 fighter squadrons to bolster the lost French cause. Almost none of this context, needless to say, is provided in Nolan’s movie: nor need it be, judging by his success in conveying the high drama of the evacuation. Many critics have bestowed five-star reviews on his efforts, and an army of cinema-goers – not just in the UK – has responded with real emotion to his evocation of those eleven days. His spare script strips away all real people and all extraneous explanation – indeed, all Germans, too: the only soldiers shown killing British troops are French defenders of Dunkirk, mistaking stragglers for enemies. We see barely half a dozen planes (over a thousand were engaged during the retreat), and only rarely the flotilla of “little ships” (including some actual survivors from the period): the craft captained by Mark Rylance seems to spend most of its time in the film alone at sea. None of the main characters in the movie is “real”: indeed, we barely know their names, so emblematic is their purpose: lost soldier, intrepid pilot, naval officer, wise sea salt. 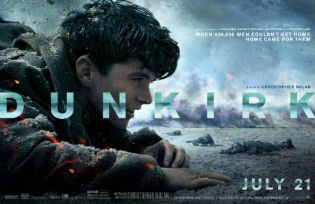 The tremendous vista of the packed beaches (Dunkirk playing itself in the film) is heart-stopping, and the combination of spectacular cinematography, stirring music and bold editing keeps the emotional level high through an impressively economical (for a big-budget blockbuster) hour and three quarters running time. The conceit at the heart of Nolan’s approach – intercutting a week on the beach with a day at sea and an hour in the air – clearly works for most reviewers and much of the audience. What it risks is a cumulative undercutting of credibility. As night shots intermingle with day, the improbability of such a lengthy Channel crossing, added to the impossibility of a Spitfire staying airborne for more than an hour, combine to invite the audience to suspend disbelief. The fighter pilot’s fuel gauge is damaged, so he uses chalk marks to register his remaining flying time. We only realise that this is a McGuffin when he flies on serenely, apparently through a second (or third?) day, coasting along until he glides to a halt on the beach itself, after winching down his undercarriage (an inherently unbelievable manoeuvre, as his wheels would surely have sunk into the sand, tipping him into a fatal cartwheel: better to belly-flop). These reactions, of course, only arise if the emotional connection to Nolan’s film has been lost. But at that point, further difficulties arise. Many of the points of tension in the film seem to have been borrowed from other war movies. A pilot ditches his plane in the sea, only to find he cannot detach his canopy (he is rescued at the last minute, naturally). The first combatant the Rylance character rescues is a shell-shocked victim of a U-boat attack. A dozen soldiers on the sands decide to take refuge in a beached cargo vessel, only to face being drowned when it is floated by the tide, after the hull is repeatedly holed by German rifle shots (why they are not rather shooting at the tens of thousands of fully exposed soldiers 100 yards away is unexplained). Stripping away these cliché-ridden moments – actually, the scene in the beached cargo vessel goes on for a long time – and the film seems ever more dependent on its core conceit. Indeed, the opening captions set out the tripartite structure quite openly: this is more of a theme park ride than a naturalistic account of the events at Dunkirk, let alone their significance. Judging by the box office response, with receipts running into the hundreds of millions of dollars, and recommendations from enthusiastic reviewers for Oscar nominations in half a dozen categories, Nolan’s judgement as to what works cinematically is clearly correct. As the film reaches its climax, Hans Zimmer’s throbbing score morphs into “Nimrod” (the most rousing of the Enigma Variations). Credit is duly given in the closing captions to Elgar; and indeed, to an unspecified number of other people, as the film is dedicated to “all” those “impacted” by the events at Dunkirk. There have been dozens of British war films, some of high quality (“The Cruel Sea”, “The Bridge On The River Kwai”), some celebrating British heroics (“The Dam Busters”, “Reach For The Sky”, “The Battle of Britain”, “In Which We Serve”), some offering detailed accounts of major battles (“The Longest Day”), and some frankly plodding (including the 1958 version of “Dunkirk”, starring John Mills, Richard Attenborough and Bernard Lee). Scenes on the Dunkirk beaches featured vividly in Joe Wright’s film of Ian McEwan’s “Atonement”, ten years ago. Three years before that, a 3-hour BBC docudrama told the story of Dunkirk, but with far less “impact” than Nolan’s visceral account. One can only be pleased that a British film director, who could quite easily follow a lucrative career in Hollywood, has chosen to invest his time – and persuade Warner’s to invest its money – in such a quintessentially British subject as “Dunkirk”. Christopher Nolan is a film-maker, not an historian. Whatever the film’s omissions and errors, it is nonetheless a powerful creative achievement, and Nolan clearly seems to have “impacted” hundreds of thousands of movie-goers. Its takings in the UK may yet exceed those of his previously most successful Batman movie, “The Dark Knight”. In an interview for The Guardian, Nolan told of wanting to find gaps in previous accounts of Dunkirk that he might fill: why else engage with the subject? Having myself combed through the archives of stills and film of the actual events – and found them understandably meagre – I have to acknowledge that he has visualised them with startling clarity and admirable simplicity. But in terms of understanding the significance of Dunkirk, he offers neither insight nor understanding: just an introduction for new audiences to an operation about which they might have been previously completely ignorant. In military terms, whereas the Western Front had been the crux of the First World War, grinding millions of men to their deaths, in World War Two it was Eastern Europe and the Pacific which were the main theatres of combat. The rescue of 200,000 British and Empire troops, against the odds, was remarkable, and allowed Britain to take the war to the Germans in North Africa once it had survived the Blitz and seen off the threat of invasion. But the biggest turning points in the conflict came in 1941, with Germany’s attack on the Soviet Union and Japan’s bombing of Pearl Harbour. It was the immense Russian and American manpower resources which turned the tide of aggression. Britain played its part, in which surviving alone, for twelve months, against Germany was perhaps the most vital element; and Dunkirk in turn was part of that story. As Nolan’s film correctly observes, the soldiers that came back from the beaches were not vilified as cowards and failures, but were surprised to be greeted as heroic survivors. Churchill managed to shrug off the military disasters of Narvik and Dunkirk, and instil and personify a public mood of defiance; opinion surveys at the time showed that just 3% of those asked imagined Britain would lose the war. “Dunkirk” the movie captures a hint of this: but it manages to leave Dunkirk the actual event shorn of context and deeper meaning. Emotion and understanding are very different human responses; it is easy to see why the former is a much surer route to box office success.